Within the STEAM4U project, a toolkit to measure self-efficacy in STEM has been developed, which includes a collection of model tools, real examples of tools and other examples of tools from the literature addressed both to 10-14-year-old teens and adult stakeholders (teachers, parents, STEM experts, volunteers…). According to the nature of self-efficacy beliefs in STEM, ideal tools for measure this construct are those ones in which the subject of the study (teen, teacher, parent…) actively participates the data collection, expressing their inner thoughts. For this reason, the STEAM4U toolkit only considers questionnaires/surveys, interviews and diary protocols. Based on the model tools, these tools have been created by the organisations who participate in the STEAM4U project to assess the impact of different European initiatives on teens’ and adult stakeholders’ self-efficacy in STEM. Download here all the STEAM4U concrete tools (PDF). Questionnaires, diaries and interview guidelines model for assessing self-efficacy in STEM and other related variables with STEM stance and inequity. 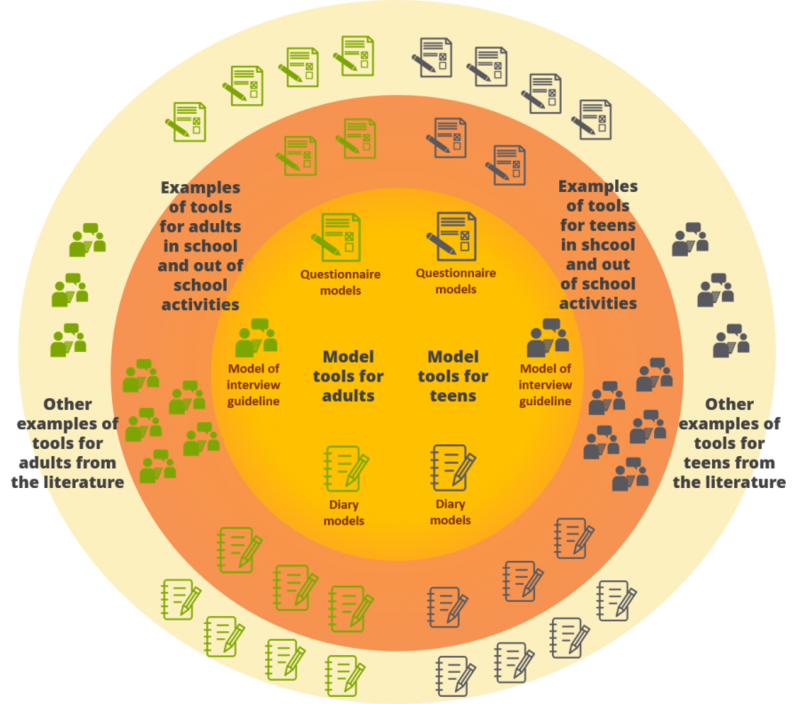 Model tools are both addressed to 10-14-year-old teens and adult stakeholders, such as families and teachers/ volunteers/ educators. Download here all the model tools developed in the STEAM4U program (PDF). All references of the cited studies can be found in the page of references. Examples of tools for assessing self-efficacy in STEM in teens and adults found in the literature are also included as examples in the STEAM4U toolkit. The purpose of this compilation of already existent tools is not to offer an exhaustive list, but a selection of those significant tools for the substantiation and elaboration of the STEAM4U toolkit. Assessing Women in Engineering (AWE). The instrument is designed to measure undergraduate women students’ self-efficacy in studying engineering, based on a 9 factor model: 1) confidence that women can succeed in an engineering career, 2) confidence in personal success in engineering curriculum, 3) feeling of inclusion and having engineering role models, 4) confidence in doing well in engineering major, 5) confidence in being able to cope with difficulties, 6) expectation that math is important for career and self-worth, 7) expectation that engineering degree will result in obtaining desired lifestyle and job, 8) expectation to get fair chance in engineering job market, and9) expectation to be treated fairly in an engineering job and to feel part of the group. Biology Self-efficacy Scale Instrument (BSES). This questionnaire is aimed at assessing students’ self-efficacy in Biology in 3 factors: 1) self-efficacy in methods of biology, 2) self-efficacy regarding other STEM fields, and 3) self-efficacy in the application of biological concepts and skills. Chemistry Self-efficacy scale instrument (CSES). Based on the Biology Self-efficacy Scale, this questionnaire is aimed at assessing students’ self-efficacy in Chemistry in 3 factors: 1) self-efficacy in methods of biology, 2) self-efficacy regarding other STEM fields, and 3) self-efficacy in the application of biological concepts and skills. College Chemistry Self-efficacy Scale. This questionnaire is aimed at assessing college students’ self-efficacy in Chemistry in 3 factors: 1) self-efficacy for cognitive skills, 2) self-efficacy for psychomotor skills, and 3) self-efficacy for everyday applications. Computer self-efficacy instrument. Not specifically addressed to teens, this questionnaire is aimed at assessing computer self-efficacy in 9 factors: 1) encouragement of use, 2) others’ use, 3) support, 4) computer self-efficacy, 5) performance outcome expectations, 6) personal outcome expectations, 7) effect, 8) anxiety, and 9) use. Multidimensional Scales of Perceived Self-Efficacy (MSPSE) or Children’s Multidimensional Self-efficacy Scales. Scales of the MSPSE questionnaire assess self-efficacy in nine domains: 1) enlisting social resources, 2) academic achievement, 3) self-regulated learning, 4) leisure-time skills and extracurricular activities, 5) self-regulatory efficacy (to resist peer pressure for high risk behaviors), 6) self-efficacy to meet others’ expectations, 7) social self-efficacy, 8) self-assertive efficacy, and 9) enlisting parental and community support. Self-efficacy for Science (SEFS). This questionnaire is designed to predict academic performance in the science areas of a first-year undergraduate nursing course. The model is based on 6 factors: 1) mathematics science, 2) domestic applications, 3) lifestyle, 4) science principles, 5) practical science, and 6) physics applied. Self-Efficacy Questionnaire for Children (SEQ-C). This questionnaire is aimed at assessing students’ self-efficacy in 3 factors: 1) social self-efficacy, 2) academic self-efficacy, and 3) emotional self-efficacy. Self-Efficacy and Metacognition Learning Inventory –Science (SEMLI-S). This questionnaire is aimed at assessing students’ self-perceived metacognitive science learning orientation in 5 factors: 1) constructivist Connectivity, 2) monitoring, evaluation & planning, 3) science learning self-efficacy, 4) learning risks awareness and 5) control of concentration. Self-efficacy in Technology and Science (SETS). This questionnaire is aimed at assessing self-efficacy of middle-school students in technology and science in 6 factors: 1) self-efficacy on science inquiry, 2) self-efficacy on videogaming, 3) self-efficacy on computer gaming, 4) self-efficacy on general computer use, 5) self-efficacy on problem-solving computer use, and 6) self-efficacy on synchronous chat use. Science Aspirations questionnaire. This questionnaire is aimed at assessing students’ aspirations in science in 6 factors: 1) aspirations in science, 2) parental attitudes to science, 3) attitudes towards school science, 4) self-concept in science, 5) images of scientists, and 6) interest in science outside of school. Science Motivation Questionnaire (SMQ). This questionnaire is aimed at assessing students’ motivation to learn science in 5 factors: 1) intrinsic motivation and personal relevance, 2) self-efficacy and assessment anxiety, 3) self-determination, 4) career motivation, and 5) grade motivation. Science Motivation Questionnaire II (SMQ-II). This instrument assesses the motivation of students to learn science in college courses in 5 factors: 1) intrinsic motivation, 2) self-determination, 3) self-efficacy, 4) career motivation, and 5) grade motivation. STEM Career Interest Survey (STEM-CIS). This questionnaire is aimed at assessing middle students’ interest in STEM in 8 factors: 1) outcome expectation, 2) interest in technology, 3) contextual support, 4) personal input, 5) self-efficacy, 5) personal goal, 6) interest in engineering, 7) interest in science, 8) interest in mathematics. It is distributed in 4 subscales: science, mathematics, technology and engineering. Sources of Science Self-Efficacy Scale. This questionnaire is aimed at assessing self-efficacy and other motivation variables among high school science student in 8 factors: 1) effects of mastery experiences, 2) vicarious experiences, 3) social persuasions, 4) physiological states, 5) science grade Self-efficacy, 6) science self-concept, 7) science anxiety, and 8) science achievement. Against the Odds: self-efficacy beliefs of women in Mathematical, Scientific, and Technological careers. The purpose of the interviews was to explore the personal stories of women who selected and continue to excel at careers in areas of mathematics, science, and technology to better understand the ways in which their self-efficacy beliefs influenced their academic and career choices. An Investigation of the Self-Efficacy Beliefs of Black and Hispanic Students that have Experienced Success or Failure in Mathematics. Through interviews, the study explores the self-efficacy beliefs of Black and Hispanic middle school students that have experienced success or failure on a standardized mathematics test. Self-efficacy sources and academic motivation: a qualitative study of 10th graders. The purpose of the interviews was to provide an understanding of 10th grade students developmental self-efficacy sources, self-efficacy source experiences, and academic motivation. Interview protocols for students, teachers, administrators and guidance counsellor are provided in the study. Computer self-efficacy instrument. Not specifically addressed to teachers/ educators/STEM experts, this questionnaire is aimed at assessing computer self-efficacy in 9 factors: 1) encouragement of use, 2) others’ use, 3) support, 4) computer self-efficacy, 5) performance outcome expectations, 6) personal outcome expectations, 7) effect, 8) anxiety, and 9) use. Physics Secondary School Self-efficacy Beliefs. This questionnaire is aimed at measuring self-efficacy beliefs of secondary school physics teachers, based on 2 factor model: 1) General efficacy belief in physics teaching and 2) personal efficacy belief of physics teachers. Self-efficacy beliefs about Equitable Science Teaching (SEBEST). This questionnaire is aimed at assessing the self-efficacy beliefs of prospective elementary teachers with regards to science teaching and learning for diverse learners, based on 2 factors: 1) personal self-efficacy, and 2) outcome expectancy. Self-efficacy for Teaching Mathematics Instruments (SETMI). This questionnaire is aimed at measuring self-efficacy of elementary mathematics teachers in 2 factors: 1) self-efficacy for pedagogy in mathematics, and 2) self-efficacy for teaching mathematics content. Self-efficacy teaching and knowledge instruments for science teachers (SETAKIST). This questionnaire measures self-efficacy beliefs of science teachers in two factors: 1) teaching efficacy, and 2) knowledge efficacy. Science Teacher Efficacy Belief Instrument (STEBI-A). This questionnaire is aimed at assessing elementary teacher’s self-efficacy in teaching science in 2 factors: 1) personal science teaching efficacy beliefs and 2) science teaching outcome expectancy. Science Teaching Efficacy Belief Instrument-Preservice (STEBI-B). This questionnaire is aimed at measuring science teaching self-efficacy and outcome expectancy in preservice elementary teachers in 2 factors: 1) personal science teaching efficacy beliefs and 2) science teaching outcome expectancy. A qualitative study of factors influencing science teaching self-efficacy of elementary level teachers. Interviews are used to examine factors which influence personal science teaching efficacy and science teaching outcome expectancy in elementary teachers. A qualitative study investigating the sources of teachers efficacy beliefs. The purpose of the interviews is to examine the sources of secondary school teachers’ efficacy beliefs. In much self-efficacy research, diaries or self-reports try to measure intentions to engage in activities and use of strategies. These tools have advantages, but they fail to account for many aspects of classroom teaching and learning (Schunk, 1991). Thus, they should be used as a complementary data source. Condensed accounts. Condensed accounts often include phrases, single words, and unconnected sentences that reflect the participant externalisation of thoughts while he/she is living the experience (Spradley, 1980). Condensed notes may still be the best way to quickly record key phrases and to identify major events. The expanded account. As soon as possible after each session (or after making a condensed account), the participant should fill in details and recall things that were not recorded on the spot. The key words and phrases jotted down can serve as useful reminders to create the expanded account (Spradley, 1980). The journal or the diary. Like a diary, this journal will contain a record of experiences, ideas, fears, mistakes, confusions, breakthroughs and problems that arise during the participation of the workshops. Each journal entry should be dated (Spradley, 1980). An example of a diary can be found in the research of Schmitz & Perels, (2011).